In 2017, Earth Overshoot Day was already reached on August 2, 2017. The Pledge: I will carry out economic activities with the goal to meet the needs of the present while safeguarding Earth's life-support systems, on which the welfare of current and future generations depends. The notion of our planet being a life-support system for all life plays a central role in understanding humanity’s relationship to the planet. 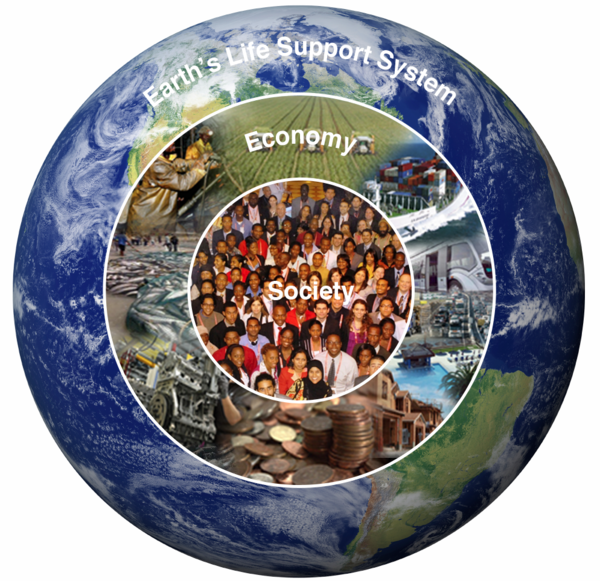 Humanity is embedded in, and dependent on, the Earth's life-support system (ELSS). Communities of human and non-human animals interact with the ELSS through flows of energy and matter; they take from the ELSS what they need to sustain the population, and they give back to the ELSS what remains after they have processed matter and changed the state of energy. All communities impact the ELSS in a complex way, and their interactions can improve or degrade the state of the ELSS with consequences for all other communities depending on the ELSS. The flows between the ELSS and human communities are controlled to a very large extent by our ethical, social, and economic rules. For more than 250 years, almost all interactions of humans with the ELSS are economic in nature and controlled by an economic model that disregards the wealth of the non-human environment. Humanity has been extremely successful in modify the flows, seemingly to our advantage. Recently, we have emerged as the operators of the ELSS. Being the only species that ever achieved this position in the ELSS, we have a new enormous responsibility. If we make mistakes, these mistakes will have enormous consequences. To reach sustainability, safeguarding the ELSS has to be congenital to the economic rules. Although the vast majority of normative ethical accounts demand that the human population transitions to a fair, sustainable lifestyle, the economic rules that require perpetual growth are in tension with this moral requirement. In fact, the current rules are sustaining growth by accelerating the main mass and energy cycles in the ELSS leading to a cataclysmic degradation. Humanity has developed into the “anthropogenic cataclysmic virus” (ACV) in the ELSS. To reach sustainability, this virus is challenged with a transition into the healer. For more than 200 years, almost all interactions of humans with the ELSS are controlled by economic models that disregard the wealth of the non-human environment. Adam Smith (1776) defined the purpose of economy to be the creation of human wealth, with no regard for the impact this creation of wealth might have on the ELSS. As John M. Greer (2011) states, “it would be by no means inappropriate to define all of modern economic thoughts as footnotes to Smith.” One of those footnotes is the work of Milton Friedman, who redefined in 1970 the purpose of business as maximizing profit for the shareholders. Focusing totally on making money, and forgetting about any concerns for employees, customers, society or the ELSS, amplified the impact of Adam Smith’s original idea. In connection with the easy access to energy and new technologies it accelerated the degradation of the ELSS. Only recently have we started to realize that the disregard of non-human wealth actually threatens not only our survival as a species but also endangers our economies (Heal, 2017; Korten, 2015). As a consequence of our unparalleled but unsustainable success, there is a need to reconceptualize the purpose of economy. For civilization to prevail, we need to transition to an Economy for Humanity (E4H) that sustains and creates thriving communities embedded in a healthy ELSS. E4H aims to initiate this great transition by implementing a pledge for investors, producers, traders, users, and customers to participate responsibly in economic activities with the mission to safeguard and restore the life-support system. Based on a holistic measure of the state of humanity and the ELSS, E4H is developing a certification system with comprehensive criteria as a basis on which those participating in economy activities, be it as user, producer, trader, or facilitator, can make decision on which products to produce, trade and use. The certification system recognizes the degree to which we all live up to this pledge. The development of criteria and best practices for an E4H supports those who take the pledge. By recognizing and rewarding those who do most to safeguard the ELSS as part of their participation in economy, E4H enables a new economic framework and a societal dialog about an economy for humanity that recognizes the fundamental role of the health of the ELSS for our civilization. The approach of medicine to safeguarding the health of individuals and communities has proven to be extremely successful over many centuries. The “Hippocratic Oath” was fundamental for the development of medicine in service of humanity. Applying a similar approach to safeguarding the ELSS by developing a basis for a pledge to an economic practice in service for humanity with the health of the ELSS being congenital to economy has a very high potential to change the future of humanity and increase the prospects of our civilization. E4H aims at engaging global expert communities as well as a wide range of NGOs and intergovernmental organizations in the development of a planetary medicine and a laboratory for “patient Earth.” The development and validation of a planetary medicine that understands the physiology and processes that maintain a “healthy” ELSS addresses questions including: (a) What is the ELSS? (b) What are the main physiological processes? (c) How does the economic model and its rules impact the human role in, and interaction with, the ELSS? (d) What are the vulnerabilities? (e) What is the current state and what are the trends? In addressing these questions, E4H reviews the current ethical, social and economic norms and rules, and identifies core impacts on the ELSS. Realizing that the flows between human communities and the non-human components of the ELSS are controlled by fully mind-dependent ethical, social and economic concepts, rules, and practices, it becomes obvious that we have a mind-based system that is coupled to a mind-independent “real world.” It is this understanding of humanity embedded in the ELSS that provides the basis for the approach of E4H: the ethical, social, and economic rules are the “software” or “brain” representing the governance impacting the behavior and development of the “hardware” or “body” that the ELSS represents. By changing the rules and governance, the health of the body can be impacted.